KAMPALA – ICT State minister Idah Nantaba has transferred her mother, Ms Jane Naluwooza, from her home in Ndeeba Village, Kayunga District, to her Kampala home following the March 24 incident that led to the death of Ronald Ssebulime. Ssebulime was shot dead by police after the minister claimed he was trailing her on his motorcycle. However, police later admitted that he had no case and was on his way to school to visit his children. And now it has emerged that Ms Nantaba has since relocated his mother for security reasons. 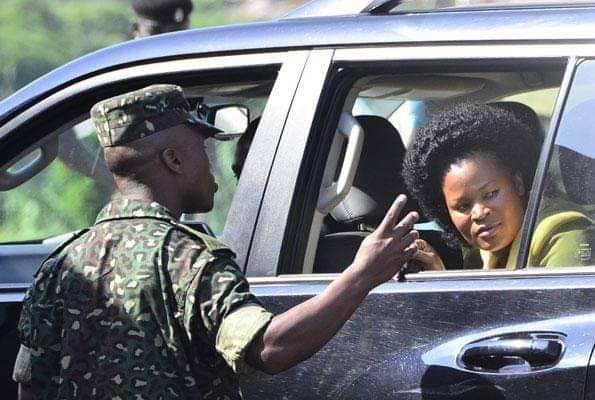 In an interview, Ms Nantaba confirmed the development and said that it is a precautionary measure, insisting that she cannot rule out that Ssebulime wanted to kill her. She also dismissed claims that she is responsible for Ssebulime’s death, explaining that for her only reported to police after she became suspicious that the biker was trailing her. “Was I the one who ordered for Ssebulime’s shooting?” Ms Nantaba asked. Meanwhile, a cross-section of leaders and residents of Kayunga District have asked Ms Nantaba to step aside and also make a public apology to the country for causing the death of Ssebulime. Ronald Ssebulime, who was shot dead by police on March 24 in Kayunga District, was yesterday emotionally laid to rest in Mubende District. “Ms Nantaba should feel embarrassed and step aside to pave way for investigations. She is a Christian and should act like one. If it was not her reporting the innocent biker to police, he wouldn’t have been killed,” Mr George William Batte, the Kangulumira sub-county LC 3 chairman, said. The Galilaaya sub-county district councillor Mr Fred Ssemyalo, asked Ms Nantaba to take responsibility of the late Ssebulime’s family since he was the bread-winner. “She (Nantaba) should pay for the education of Ssebulime’s children and also look after his family. If she does that then, she would bring down the tempers of many Ugandans who are annoyed with her,” Mr Ssemyalo, said. Other constituents like Ms Prossy Naava asked president Museveni to relieve Ms Nantaba of her duties as State minister for ICT. “As common people, we now fear to go near her vehicle because she might look at us and get suspicious that we want to harm her. She should assure boda boda cyclists that they will be safe if they go near or follow her car,” Ms Naava said.